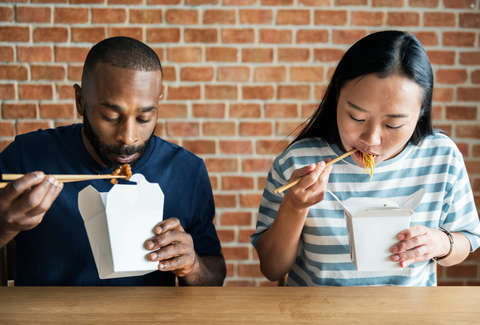 When the human species gets hungry, it no longer forages for sustenance in the wild, but searches the internet for Chinese takeout. According to the average late night quest on Google, hunger strikes at the international standard intervals of 7pm and 2am, as a new study in the Royal Society For Open Science explains that our stomachs are all just trying to be fed, regardless of our culture and geography. Since it would be too easy to just comb through Google Trends, researchers used software systems to sift through five years of search data pertaining to food-related terms. Across the world and regardless of time zone, searches spiked at 7pm and 2am, and remained constant throughout the year regardless of season. Queries for "pizza delivery" had a predictable cresting period at 7pm, but given the uniformity of all search patterns included in the study, researchers concluded "the patterns are not culturally dependent and instead are biologically motivated." Or, in other words, we're not conditioned to eat dinner at 7pm because it's become ironed into our consciousness as the universal standard of supper. We're conditioned to eat dinner then because it's what our bodies want. The researchers are transparent about not having all of the necessary data to illustrate that point thoroughly, but rather suggest that our digital foraging is all the product of "an underlying biological driver." They point to Google Trends' tendency to predict spikes in "rhythms of influenza as well as other common childhood diseases" as an indication of whatever this ethereal "biological driver" is. Anyway, there's nothing like a commonality of international pizza searches to make you feel more closely connected to humanity.